The history of Jonah contains a great mystery. For it seems that the fish signifies Time, ‎which never stands still, but is always going on, and consumes the things which are made by long ‎and shorter intervals. 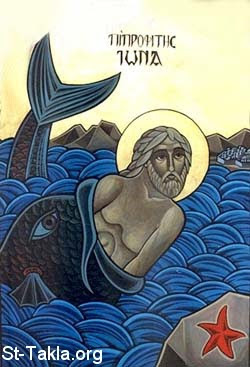 ‎But Jonah, who fled from the presence of God, is himself the first man who, having ‎transgressed the law, fled from being seen naked of immortality, having lost through sin his ‎confidence in the Deity. ‎The ship in which he embarked, and which was tempest-tossed, is this brief and hard life ‎in the present time. Just as though we had turned and removed from that blessed and secure life, ‎to that which was most tempestuous and unstable, as from solid land to a ship. For what a ship is ‎to the land, that our present life is to eternal life. ‎His being swallowed by the whale signifies our inevitable removal by time. For the belly ‎in which Jonah, when he was swallowed, was concealed, is the all-receiving earth, which ‎receives all things which are consumed by time. 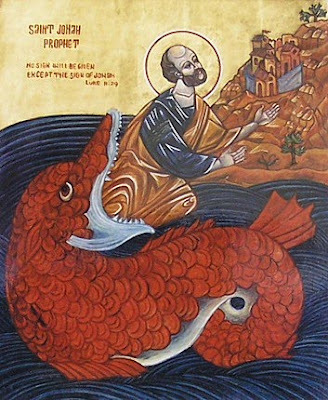 ‎As Jonah spent three days and nights in the belly of the fish and was delivered up ‎sound again, all of us who have passed through the three stages of our present life on earth—the ‎beginning, middle, and end— rise again. For our present time consists of three intervals: the past, ‎the future, and the present. Thus, the Lord spent three days in the earth as a symbol to teach us ‎clearly that our resurrection shall take place after these intervals of time have been fulfilled. Our ‎resurrection shall be the beginning of the future age and the end of this. In that age, there is ‎neither past nor future, but only the present. And when we examine the story of Jonah, great is the force of the resemblance. Jesus was sent to ‎preach repentance; Jonah also was sent: but whereas the one fled, not knowing what should come to pass; ‎the other came willingly, to give repentance unto salvation. 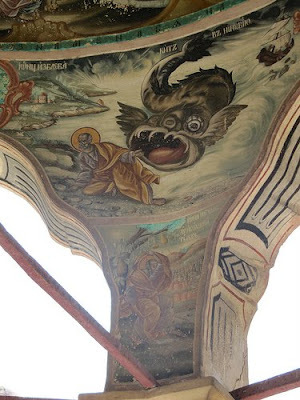 Jonah was asleep in the ship, and snoring ‎amidst the stormy sea; while Jesus also slept, the sea, according to God’s providence, began to rise, to show ‎in the sequel the might of Him who slept. To the one they said, “Why are you sleeping? Arise, call ‎your God, that God may save us;” but in the other case they say unto the Master, “Lord, save us.” Then ‎they said, "Call upon thy God"; here they say, "save Thou". But the one says, "Take me, and cast me into the ‎sea; so shall the sea be calm unto you"; the other, Himself rebuked the winds and the sea, and there was a ‎great calm. The one was cast into a whale’s belly: but the other of His own accord went down, where the ‎invisible whale of death is. 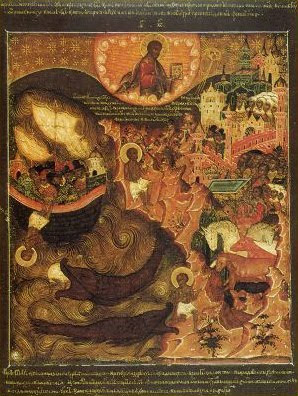 And He went down of His own accord, that death might cast up those whom he ‎had devoured, according to that which is written, "I will ransom them from the power of the grave; and from ‎the hand of death I will redeem them". 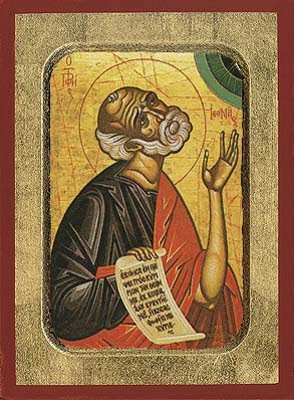 For a complete commentary on the Book of Jonah by St. Jerome, see here. But, as I have learned from a man skilled in these subjects, and able to grasp the ‎depth of the prophet, by means of a reasonable explanation of what seems unreasonable ‎in the history, it was not this which caused Jonah to flee, and carried him to Joppa and ‎again from Joppa to Tarshish, when he entrusted his stolen self to the sea: for it was not ‎likely that such a prophet should be ignorant of the design of God, viz., to bring about, by ‎means of the threat, the escape of the Ninevites from the threatened doom, according to ‎His great wisdom, and unsearchable judgments, and according to His ways which are ‎beyond our tracing and finding out; nor that, if he knew this he would refuse to cooperate with God in the use of the means which He designed for their salvation. Besides, ‎to imagine that Jonah hoped to hide himself at sea, and escape by his flight the great eye ‎of God, is surely utterly absurd and stupid, and unworthy of credit, not only in the case of ‎a prophet, but even in the case of any sensible man, who has only a slight perception of ‎God, Whose power is over all. On the contrary, as my instructor said, and as I am myself convinced, Jonah ‎knew better than anyone the purpose of his message to the Ninevites, and that, in ‎planning his flight, although he changed his place, he did not escape from God. Nor is ‎this possible for any one else, either by concealing himself in the bosom of the earth, or ‎in the depths of the sea, or by soaring on wings, if there be any means of doing so, and ‎rising into the air, or by abiding in the lowest depths of hell, or by enveloping himself in a ‎thick cloud, or by any other of the many devices for ensuring escape. For God alone of all ‎things cannot be escaped from or contended with; if He wills to seize and bring them ‎under His hand, He outstrips the swift, He outwits the wise, He overthrows the strong, He ‎abases the lofty, He subdues rashness, He represses power. For Jonah was a servant, but I am the Master; and he came forth from the great fish, but I rose from death. He proclaimed destruction, but I am come preaching the good tidings of the kingdom. The Ninevites indeed believed without a sign, but I have exhibited many signs. They heard nothing more than those words, but I have made it impossible to deny the truth. The Ninevites came to be ministered to, but I, the very Master and Lord of all, have come not threatening, not demanding an account, but bringing pardon. They were barbarians, but these - the faithful - have conversed with unnumbered prophets. And of Jonah nothing had been prophesied in advance, but of me everything was foretold, and all the facts have agreed with their words. And Jonah indeed, when he was to go forth, instead ran away that he might not be ridiculed. But I, knowing that I am both to be crucified and mocked, have come nonetheless. While Jonah did not endure so much as to be reproached for those who were saved, I underwent even death, and that the most shameful death, and after this I sent others again. And Jonah was a strange sort of person and an alien to the Ninevites, and unknown; but I a kinsman after the flesh and of the same forefathers.